Dr. Narendranath Reddy graduated in medicine with distinction from S.V. Medical College, Tirupathi, Andhra Pradesh. He then went to the United States of America where he specialised in internal medicine and endocrinology. He has been a consultant and practicing internist-endocrinologist in Southern California for over 35 years. He is currently the chairman of the Prasanthi Council, the governing body which oversees the activities of Sathya Sai International Organisation. Presented below is the edited transcript of a talk he delivered at Ebel Club, Santa Ana, California, USA on February 2, 2014. With love and humility I offer my prayerful pranams at the divine lotus feet of our dearest, loving Lord Bhagawan Sri Sathya Sai Baba. Loving Sairam to all of you. I thank Bhagawan and all of you for giving me this opportunity to share His message, His love and His works. The bhajans were melodious and touched the heart. The super bowl is an enormous social and sporting event occurring today. Especially on this day, it is good to see priority being given to Swami rather than the super bowl. Lord Jesus said “Where there are two or three gathered together in My name, there I am in the midst of them”. Likewise, Swami, the Lord incarnate, is amongst us, right here and right now. We are indeed blessed and fortunate. We wish to express our gratitude to Mr. Robert Bozzani for the loving and selfless service he has rendered to Bhagawan for several decades. We are blessed to have had a close association with Bob for almost 30 years. We first met Bob when he moved from Arizona and became our neighbour in Arcadia. He quickly became our family friend. We then began to appreciate him as an exemplary devotee. On numerous occasions we were fortunate to have our families together at the divine lotus feet. Swami often asked devotees, “When are you leaving?” I used to reply, “Swami I bought tickets and we are leaving on such and such date”. Many people answered similarly. When it came to Bob, he would answer, “Swami, whenever you say, I will leave.” He was very sincere. Swami looked at us and said, “He is a good devotee.” Swami asked the next devotee “When are you leaving?” The devotee replied, “Swami whenever you tell”. But then Swami would say “Yeh! You already bought the tickets and you made a plan to go to the office.” He knows everything. Bob is very sincere in following the divine instructions. In His historic discourse given on May 17, 1968 during the first world conference, Swami said: “Following My instructions is enough. That will give you the summum bonum of life. It will give you more benefit than all the austerities and penance (tapas).” As Prophet Isaiah has said: “the grass is withered and the flower is fallen. But the word of our Lord endureth forever.” Therefore, we need to take His message seriously and follow His command implicitly. This is our obligation as ‘Sai Devotees’. I would like to share some of His divine words which have inspired me. On May 25, 1947 Swami wrote a historic letter to His elder brother Seshama Raju. Swami declared on October 20, 1940, when He was barely 14 years old that He is Sai Baba without the customary family ties. He then discarded His books. 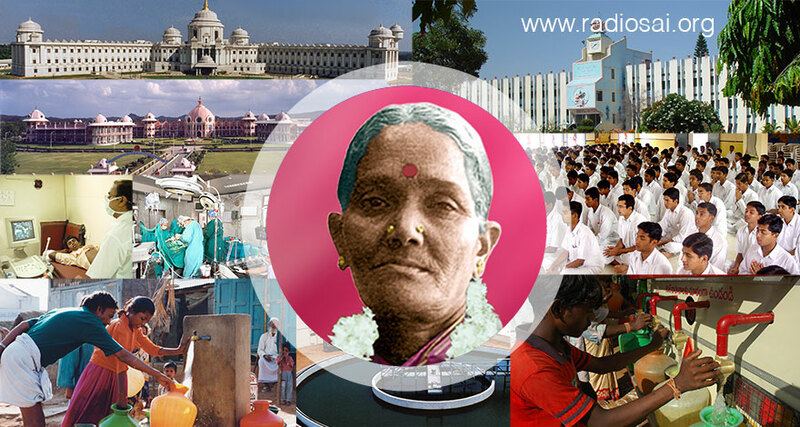 Swami’s glory spread in subsequent years drawing all types of people including royalty, scholars, the rich and famous, in addition to ordinary people. All were flocking to the holy place of Puttaparthi. Many people became jealous and began spreading rumours. Some people complained to Swami’s elder brother Seshama Raju that Swami was getting carried away with this phenomenon. Seshama Raju then wrote a letter to Swami with his concerns because he wanted his intelligent younger brother (Swami) to finish college, get a good job and take care of the family. He did not wish Swami to continue performing miracles and attracting people. 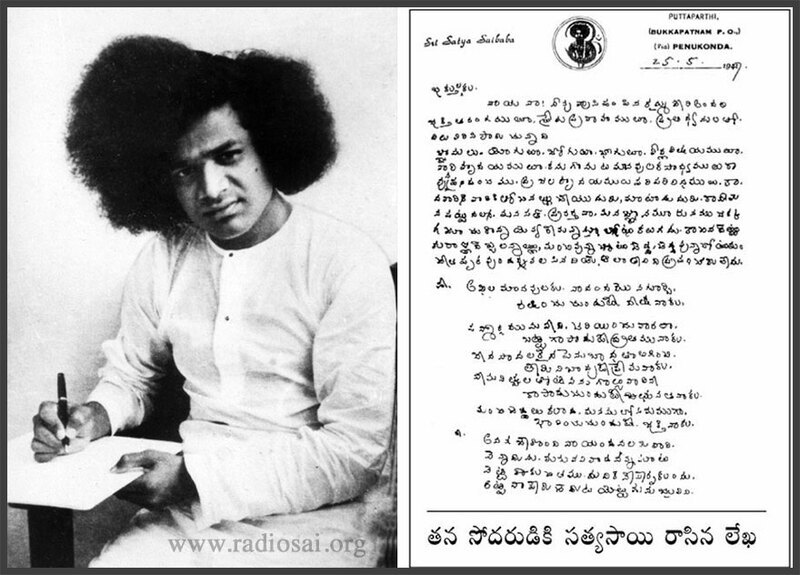 Swami then wrote an historic, epoch making letter, wherein He addresses to all His devotees and not just His brother. The message in His letter applies to all of us, and there are several divine proclamations contained within this invaluable document. 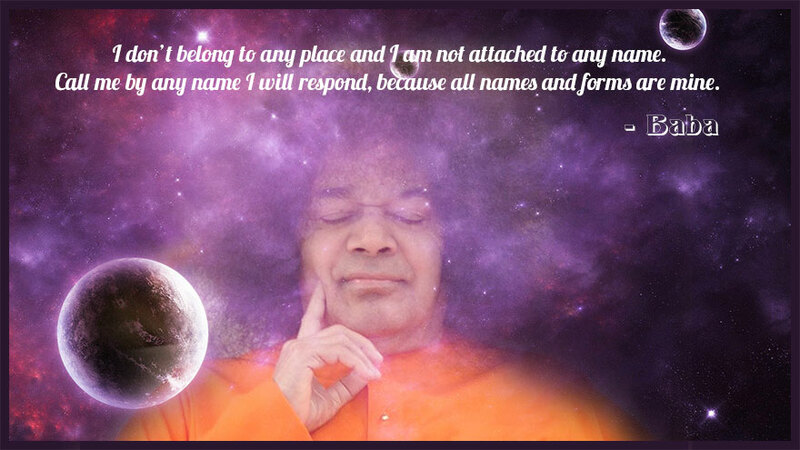 In the letter, the first divine proclamation is “No one can understand Me, either today or after thousands of years, whoever he may be, whatever his method of enquiry is, and however long it takes.” Therefore we should not try to understand Swami. He is beyond the comprehension of the mind and intellect. About thirty years ago my father used to work in the Sri Sathya Sai University as a faculty member and was involved in rural service upliftment projects. One day he was travelling with Swami to the villages and came to the bifurcation of the road. Swami asked them, “Which road should we take to go to the village?” My father was puzzled because Swami knows everything and why would He ask this question. The next day when he was with Swami, my father asked, “Swami, you know everything, why did you ask which way to go?” Swami said in Telugu “Adi anthe le (that is the way it is).” Swami told him, “Never try to understand Me. Experience My love, enjoy My love, live in My love.” We should not use logic, mind and intellect to understand Swami. This is the first divine proclamation. The second divine proclamation in the letter is “I do not belong to any place and I am not attached to any name.” In Telugu, He said beautifully, “Naaku vooru ledu, peru ledu”. It means that I don’t belong to any place and I am not attached to any name. Call me by any name I will respond, because all names and forms are mine. That is why Swami says His name is ‘BABA’. He never finished high school but Swami says that He is a double graduate, that is BA and BA. But the real meaning of BABA, Swami says is “Being, Awareness, Bliss, Atma.” We should not confine Swami to any particular name, form or attribute because He is beyond name, form, and attributes. Swami has said, “Call upon Me and I will come to you anywhere.” Swami says there is only one GOD and He is Omnipresent. Swami tells the story of how Droupadi called for Lord Krishna to save her when she was being disrobed in public. Lord Krishna came to her rescue by giving a stream of sarees and thus preserving her honour. Later, she expressed her gratitude to Lord Krishna, “Lord, you saved me but why did you take so much time? You could have come right away.” He replied, “You said ‘Dwarakavasi' (Lord of Dwaraka) so I had to come all the way from Dwaraka. If you had said ‘Hridayavasi' (indweller of heart), I would have come to your rescue right away.” Similarly if we call Swami ‘Partivasa’ He has to travel 10,000 miles. If you call Him ‘Santa Ana vasa’ He would be here sooner, but if you say ‘Hridayavasa’ He will be present immediately. We should feel He is ‘Hridayavasa’ and He will manifest instantly. A little later, I got a phone call from his nephew, who is also a doctor, stating that his uncle is panicky and disturbed. I told him that we are praying for him and we will give Vibhuti and lingam water. The gentleman and his family came to our home that evening. They were visibly upset. I reassured them, gave them Lingam water, vibhuti and took them into the Bhajan Hall. We all prayed together. As we were finishing our prayers his nephew got a phone call from his uncle informing him that what was seen on the x-ray was an old lesion and not cancer. It was amazing that within a few minutes, the Lord answered our prayers. Call Him by any name, and take Him anywhere and He is there. This is the second divine proclamation. The third divine proclamation in the letter is “If you worship Me with faith and love, I will protect you, guard you and guide you.” This is the reassurance and promise given to us. During my travels around the world I hear innumerable stories of how Swami is guiding, guarding and protecting people all around the globe. It happened to me just three weeks ago. My father suddenly went into a coma and he was admitted to the intensive care unit in septic shock with a weak pulse and low blood pressure. We prayed to Swami asking Him to do whatever is best for my father. My father was in the hospital for two weeks. For the first few days, he was unconscious and unresponsive. After four days, the first word he said was ‘Sairam’. We were very happy and relieved. Slowly he started to recover, but he could not swallow. The doctors suggested that we put a feeding tube in the stomach. But we prayed to Swami and waited. Two weeks later he was back home and able to swallow. God answers our prayers. I recall a few years ago when my mother was in a similar situation. At that time Swami was in His physical form so I faxed a message right away to Swami and Bhagawan sent a word that ‘I will take care’. What I want to emphasize is that even if the physical form is no longer present, our loving Lord is here with us and responds to our prayers. He was with us, He is with us, and He will be with us always. He is our eternal companion. We should have firm faith and conviction in this truth. The fourth important declaration in the letter is Swami’s vow to transform people, to lead people who go astray from the righteous path back to the good path. There are many examples of how Swami has transformed people. Swami said I do not want your devotion, but I want transformation of your heart. The sight of Swami (darshan) itself will transform people. I know you heard the concert of Dana Gillespie’s ‘Love the Love’. She went to Prasanthi Nilayam and with just one sight of Swami she became a vegetarian. Another example is a taxi driver who was taking us to Prasanthi Nilayam from Bangalore. He used to be a chain smoker. When he went to Prasanthi Nilayam for the first time, he saw Swami from a distance. Instantly he lost the urge to smoke and gave up the habit. It is amazing how darshan of Swami can transform people. If we as devotees do not follow Swami’s instructions, Swami may intervene. The Late Prof. Kasturi told an interesting story. There was a lady devotee of Swami who had a son-in-law who was an alcoholic. He used to abuse her daughter both verbally and physically. She prayed to Swami earnestly to help her daughter. Swami answered her prayers. The son-in-law worked as a railway official. Once when he was travelling in the first class compartment someone suddenly entered the compartment and started beating him up. As he was being beaten, he was asked if he was going to give up his drinking habit and would treat his wife properly. This continued in this fashion and the son-in-law could not take this punishment anymore. As the train reached the next station, he ran out of the compartment yelling that he was being beaten. However those who came to his aid could not find anyone; however, he had marks on his face as if he were slapped. The lesson of this story is that, if you are deserving Swami will intervene directly if needed for your benefit to transform your character. There are several instances of transformation in my family. Swami performed the marriage of my first daughter Kiran in Brindavan on June 8, 1995. My daughter had wished that her marriage to be performed in India by Swami. When my daughter asked my son-in-law Vijay about her wish, He readily agreed. Since he did not know Swami when he arrived in Brindavan he was ignorant of the ashram discipline. Swami was of course the ideal host. 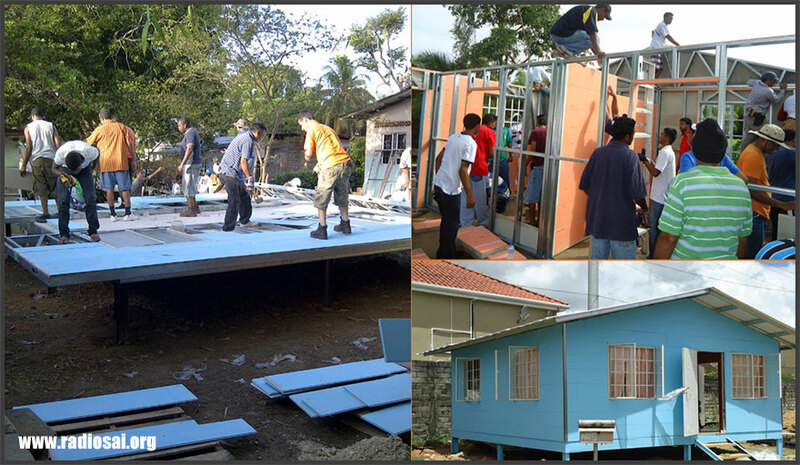 He gave them a guest house, provided nice meals and treated them very well. A couple of days prior to the wedding, Swami asked me “Where is your son-in-law?” Vijay was seated next to me and I introduced him to Swami. Vijay was used to American customs and greeted Swami as follows: “Sir, nice meeting you.” Then I nearly collapsed when he reached out to Swami with his hand to shake hands. 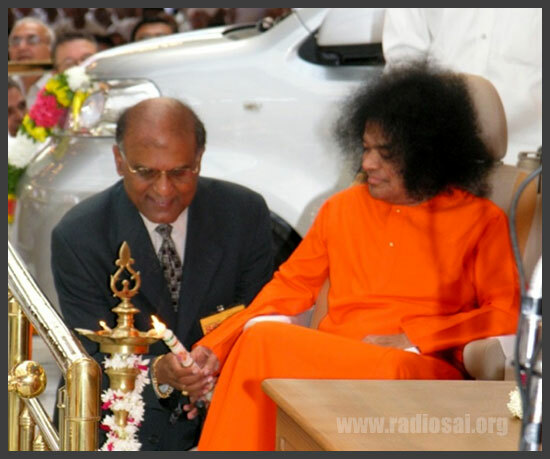 Swami, the embodiment of compassion, shook His hand with Vijay. Swami took care of all the details of the wedding including floral arrangements, nice banquet, accommodations for the guests, etc. When my daughter was nine years old Swami told her that He would perform her wedding and will arrange for the military band. We all forgot about the military band but, of course, our Swami never forgets. Swami arranged a military band during the wedding and surprised all of us. After the wedding there were people telling my son-in-law how fortunate he was to have Swami perform the wedding. At that time, my son-in-law did not realize the great boon given by Swami and felt he was doing a favour by going to India and “allowing” Swami to perform the marriage. My son-in-law asked me why people were telling him that he was so fortunate. I advised him at that time that not to worry and ignore them. I wanted him to learn by himself. After the wedding on their way back to the USA, they stopped in Italy. They met some exemplary devotees that my daughter knew. My son-in-law was impressed by the loving, compassionate nature of these Italian Sai devotees. He had never met such people. He was intrigued and the process of transformation had begun. Swami says, “My life is My message.” Our life can be His message too. Swami can transform people through His devotees. Though he was touched by Swami’s love, Vijay was really transformed because of the love of Swami’s devotees. This is an example of Swami’s fourth proclamation that He came to transform. The fifth divine proclamation is to relieve the sufferings of the poor and needy. 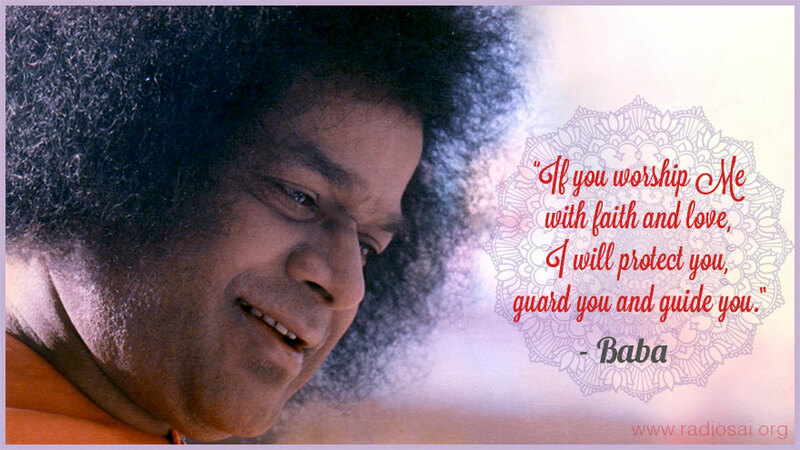 When His mother asked Swami to start a school in Puttaparthi so that the children would not have to walk to the next town, Swami started a school which then became a world class University. Education is provided from kindergarten to post graduate level completely free of cost. In these institutions the emphasis is not only on the academic excellence but also on character development. This character development is a unique feature and is the hallmark of Swami’s institutions. Similarly when mother Easwaramma prayed for Swami to start a medical clinic so that people would not have to go to the next town for medical attention, Swami responded by building a medical clinic which has now become world class super specialty hospitals in which comprehensive, state-of-the-art medical care is given completely free with love and dedication. These are unique medical institutions as they are not just hospitals but actually ‘temples of healing’. 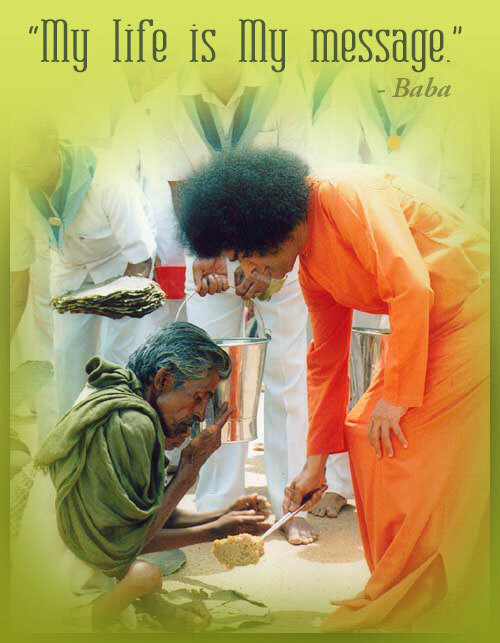 Similarly when mother Easwaramma prayed to have a drinking well dug so that villagers would no longer have to go long distances for drinking water, Swami responded by providing the well. Now this has expanded into gigantic Sathya Sai water project which is providing drinking water to millions of people. 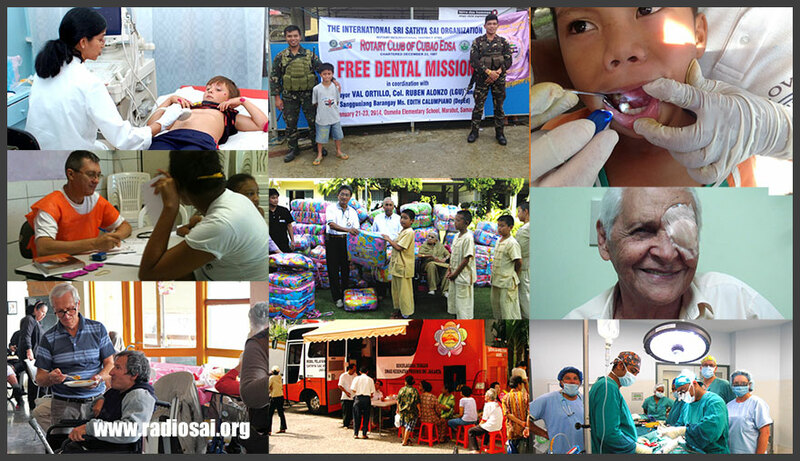 Inspired by Swami’s clarion call to serve the poor and needy Sri Sathya Sai devotees all over the world are undertaking many service projects in their community. Thousands of service projects are going on in all parts of the world today due to Swami’s inspiring example of service to the needy. The sixth proclamation in the letter is “I am never affected by honour and dishonour, praise and blame.” Swami then gives the definition of devotion. Swami says, “You may say I am devoted to Swami. Those who are devoted to Me will treat pleasure and pain, profit and loss, honour and dishonor, praise and blame, success and failure with equal fortitude. This is the true definition of devotion.” Swami says that you may say you did thousands of Japa, many hours of meditation and took part in many service projects but a real devotee is one who has equanimity. We should not be like a roller coaster going up and down. We should always be steady, with a joyous and blissful attitude, accepting all as God’s will. That is the definition of equanimity. Saint Eknath responded, “No! No! No! You did a favour to me; I need to thank you because you gave me a chance to dip in the holy river many times. Normally I dip one time and chant Gayatri only one time. Now because of you I did many dips in the holy river and chanted Gayatri several times. I thank you for giving me that privilege.” This is an example of true equanimity. This equanimity is Swami’s sixth proclamation. The seventh divine proclamation is His Sankalpa (Will). Swami has said numerous times that no one can stop His mission and no one can stop His Sankalpa, His divine will. When Swami made the announcement in 1990 that a super specialty hospital will be opened in Prasanthi Nilayam by the next birthday, November 1991, nobody could believe it could happen. In April 1991, construction began and by November 23 the construction was completed and the Sri Sathya Sai Institute of Higher Medical Sciences was opened and the first cardiac surgery was successfully performed. Only by divine will could such a massive hospital project, be completed in six months in rural India. Swami says His divine Sankalpas will happen. Nothing will come in the way. This is the seventh proclamation. Now actually if we have time, I want to show the glory of divine mission, all over the world, how it is expanding day by day. We observed more new devotees who didn’t have the good fortune of having Swami’s darshan are coming to Prasanthi Nilayam. Recently at the convocation of the Sri Sathya Sai University the valedictory address was given by Mr. Sam Pitroda, who had never come to Prasanthi Nilayam before. He was deeply touched by the discipline of the students and peaceful ambience that he witnessed during the convocation. On Swami’s birthday the union minister of State, Dr. Killi Kruparani addressed the audience and in her talk she regretted that even though she hails from Andhra Pradesh, South India she had never seen Swami and that was her first visit to Prasanthi Nilayam. More and more people who never had physical contact with Swami are drawn by His divine love and are attracted to His divine lotus feet. This is the eighth divine proclamation. Then Swami said, “Be Happy, be Happy, be Happy.” This is what Swami wants us to be. He wants us to be really happy. What is happiness? Happiness is union with GOD. He wants us to be happy and radiate that happiness. These are the real divine proclamations which everyone has to dive deep, digest, contemplate and practice and then we will really have that divine bliss. Hence if we have faith we can experience a glimpse of His reality by His grace. He says that we are very fortunate that we have this chance to experience bliss. Swami says He is giving us bliss. But we need to make good use of this opportunity. I pray to Swami to bless all of us so that we have the strength, determination and devotion to practice His message and experience the true spirit that we are embodiments of the same divinity. We are embodiments of Love. We have to make a resolution in this very life itself because we have seen Him and we have received the divine grace. Nothing can prevent us from experiencing this, sharing this and moving on. Jai Sai Ram and Thank you.